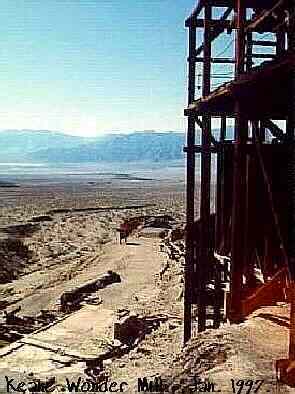 BEST TIME TO VISIT: Anytime COMMENTS: The road to this site is reached by the North turnoff to Beatty from Furnace Creek Ranch. This is the "good road" which proceeds for 2.5 miles until you reach a area suitable for parking just below the mine. 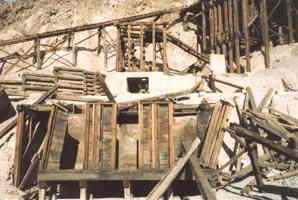 REMAINS: Tram terminals and support towers, mines and rotted wood. Inyo Independent, October 20, 1905 "FUNERAL RANGE." The following districts have been organized in the Funeral Range: South Bullfrog district, recorder C. Kyle Smith, presiding at Keane Springs, Inyo county, Cal., postoffice address, Beatty. Echo Mining district, recorder J.P. Poe, postoffice address, Beatty, care H.G. McMahon. 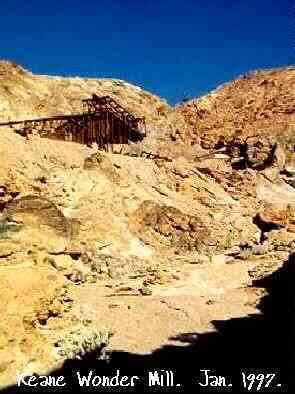 Death Valley Mining district, organized by the Pacific Coast Borax Co. A fair sized force of men is being utilized in the development of the Kean [sic] Wonder mine in the Funeral Range. The claim is located about 18 miles south of Rhyolite in the South Bullfrog mining district. At surface the ledge is from four to twenty feet in width and is traceable for a distance of 500 feet. The rock is free milling and is said to assay from $40 to $200 in gold. -- [Tonopah] Bonanza Inyo Independent, November 3, 1905 "SOUTH BULLFROG" A G. Kyle Smith and Jack Keane came up from the South Bullfrog district Monday, says the Bullfrog Miner. They report things lively in the vicinity of the Keane Wonder mine in the Funeral range. It is hinted that Mr. Keane is in camp by request of a certain big Bullfrog mine owner, who is said to be desirous of becoming interested in the wonder. A small force is working on this property, and some ore is being sacked. John and Wm. Sharp and Fred Fredericks are reported to have verbally agreed to give a bond of $50,000 to a Goldfield party on the property near the Keane Wonder. They have ore that assayed $400 in bismuth, besides values in copper, gold and silver. If the bond negotiations fail it is the purpose of the owners to drive a 200 foot tunnel. 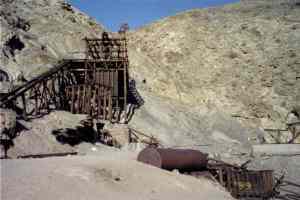 Superintendent Allen, in charge of the Chloride Cliffs property of the Death Valley Mining & Milling Company reports the uncovering of a vein that runs from $40 to $60 per ton. Five men are working. John City, better known as "Johnny Behind the Gun," is up from Ballarat to look after the Big Belle group, adjoining the Keane Wonder. Crowell, Franklin and Freefield, officers of the Cliff-Bullfrog Mining Company, are preparing to do work on that company�s claim on Chloride Cliff. Inyo Independent, November 10, 1905 "SOUTHERN INYO NOTES" [further down in column from above] John Y. McKane, the well known Goldfield mining man, has a deal pending for the Keane & Etcherren mine at Chloride Cliff. It is reported that he is operating the interests of Chas. M. Schwab. This is the property upon which Capt. De La Mar had a bond and did considerable work. Johnny City is at Ballarat to complete a deal for an extension for the Keane Wonder mine, which is said to have stood a rigid examination. Inyo Independent, February 9, 1906 Thomas McCauley has just returned from a trip to the Keane Wonder and Furnace Creek sections, says the Rhyolite Herald, and in speaking of the trip he says: "I was more agreeably surprised at what I have seen than what I have heard about Death Valley. I cannot see any excuse for any person being short of water or getting lost. There are wells and springs all over, and signs at every crossing and turn of the roads. The Keane Wonder is certainly a wonder, and should be made one of the largest mines in the country. The Death Valley Lone Star Company has a very good showing on this property, which adjoins the Keane Wonder. On the Bonanza claim, which was recently purchased from C.W. Tyler, there is an exceptionally good showing. The Bonanza ledge is from 6 to 8 feet thick and will average over $20. It joins the east side of the Poso claim of the Texas group. The Texas ledge averages over 12 feet in thickness and crops for over 1500 in length and is exposed for over 900 feet in width on the Poso and Bonanza claims, where the canyon cuts through the ledge. The Texas group was sampled by Mr. Lowry for Eastern people and his average assay on the whole ledge was $22. Taking all conditions into consideration, the Texas group is liable to turn into one of the wonders of Death Valley. The property is easy of access, being at the bottom of the canyon. The ledge is flat and there is enough ore uncovered to run a mill for a long time. The owners of the property are considering a proposition made to them to put a mill on the ground. They have plenty of water for milling purposes." Messrs. McCauley and Phail, on the recent trip, found a spring of good water, which Mr. Whince and Mr. Phail proposes to develop for the Lone Star Company. The property of the Trio Company is looking very good, and the boys have some high-grade ore in sight. Anthony and Laugan have bonded the Nevergiveup to Los Angeles capitalists for $25,000. The ground is between the Trio and the Texas. Tyler and Phail have made a strike on the Golden Horn group. They located four claims on January 1st, formerly the property of P.F. Harmon. Mr. Harmon failed to do the annual work required by law, and forfeited the ground. On January 7 he arrived there with a bunch of men who wanted to look at his property, and when informed that he had lost his claims, he said that he had figured he had done more work than the law requires, as he camped on the ground for a year, and considered that every trip he had made up into the mountain was worth $25. His people did not see the property. The ledge is bigger than the Keane Wonder or the Big Belle. The present owners are prospecting the ledge and have found some good values in several places. Mr. Harmon said that he had made ninety-four locations near Harrisburg. Messrs. Patrick and Wedekind had A.P. Rogers out to sample the Keane Wonder, on which they have an option. Mr. Rogers would not make a statement regarding the property. C.W. Tyler has located two claims formerly known as the St. Louis and Great Western. The ledge is over 4 feet wide and shows gold the entire length of both claims. One of the most wonderful sights in Death Valley is the Furnace Creek Ranch, owned by the Pacific Coast Borax Company. They can raise almost anything there. They have fresh eggs and milk the year around. The weary prospector may put his hungry burro in the corral, and fill him up with good alfalfa for 35 cents per night. There is plenty of water, over fifty inches running in the ditch, and more in a pipe line. Another garden spot is Cow Creek. There is a hot spring at this point, and Mr. Beatty has done a lot of hard work in cleaning the ground and developing and gathering the different streams. There is a small spring at the mouth of Cow Creek in which the water is very good. Cow Creek and Furnace Creek are only 14 miles from the Keane Wonder. The Keane Wonder camp is liable to be one of the largest on the desert in the near future. -- Tonopah Miner Inyo Independent, March 16, 1906 "THE KEANE WONDER SOLD" John F. Campbell, who recently purchased the Keane Wonder mine, situated in the Funeral Range about 16 miles southwest of Bullfrog, was in Tonopah this week on business connected with his company and will leave early next week for the east to complete the organization. 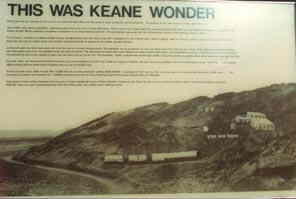 The Keane Wonder is pronounced by all who have seen it to be one of the biggest gold mines in the state. It was bonded in 1904 by Captain DeLamar for $150,000, who made a cash payment of $10,000 to the original locators, John Keane and Domingo Etcharren. DeLamar expended about $50,000 in developing the property, and would have made the final payments if it had not been for the misunderstanding which arose between him and his expert, Cohen -- the man who "turned down" the Mizpah because she "didn�t go up." The property consists of twenty claims and a number of fractions, and four or five very large, strong ledges have been opened up. The work consists entirely of tunnels. On the Keane Wonder claim about 40,000 tons of ore have been blocked out that gives average assays of $25 a ton, and it is estimated that by running the tunnel 300 feet farther this ore reserve can be increased to 80,000 tons. All of the ledges are from 10 to 25 feet wide and crop for the entire length of the claim. The company which Mr. Campbell is organizing to operate the Keane Wonder group is composed of some of the most prominent men in the country, who believe that the property can be made one of the biggest free-milling gold propositions in the state. -- Tonopah Miner Inyo Independent, March 23, 1906 "DEATH VALLEY STRIKE" The strike reported last week in the Bonanza claim of the Death Valley Lone Star, near the Keane Wonder, has been verified this week. In fact, the find is really greater than at first reported, and the Lone Star has been one of the sensations of the week, says the Bullfrog Miner. Fred C. Miles, the assayer, and Frank W. Combs made a special trip to the property, returning Wednesday with many pieces of the ore. This rock shows free gold in large quantities. It is a beautiful grade of white quartz and full of life. The open cut is all in quartz, with a well defined streak in the breast of the cut that is from 12 to 18 inches wide and carries the free gold. President Phail, Secretary Kerns and other officers, of the company, are of course, highly elated over the turn of affairs. Inyo Independent, March 30, 1906 "EXCELLENT SHOWING" "The Keane Wonder mine has a million dollars� worth of free milling ore blocked out and ready to break down averaging from $20 to $25 in gold," says Thomas Keane, superintendent of the Goldfield Great Bend mine, who has examined the property several times. Mr. Keane is one of the principal owners in the Great Bend, one of the big bonanzas of Goldfield, and he was the man who found the ore in the old workings before he interested Loftus and Davis in the property. 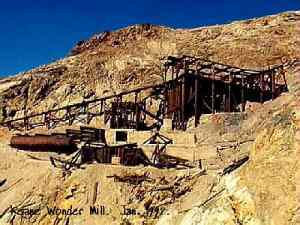 In his report on the Keane Wonder he estimates over 50,000 tons blocked out, and gives the average as $20 or possibly $25 per ton in gold, the ore being free milling, with sufficient water for milling purposes on the property and wood only six miles away. Besides the ore blocked out, he reports that with 300 feet more drifting practically $2,000,000 worth of ore more would be blocked, as shown from the outcropping in other words, the ledge crops from 750 feet, 250 of it has been developed, and the undeveloped portion of the ledge shows as good values on the outcrop as the other. Besides the ore in this place, considerable work has been done on three other big ledges, showing average values of $16 gold on one ledge cropping from 8 to 10 feet wide and cropping on the surface for 250 feet. A two-foot shoot in the center averages $42 and contains streaks that go better than $300 in gold. Another big ledge between 10 and 15 feet wide and outcropping for 200 feet averages from $5 to $9. On this ledge 100 feet of work has been done, showing up several thousand tons of ore. An 80 foot tunnel on another ledge from 10 to 15 feet wide and cropping for 200 feet gives an average from $6 to $10, not counting 12 inches averaging $217. The report states that there are 20 claims, with about 1000 of development work done on them, and pannings show values on every claim. The railroad now being built into Bullfrog will pass within six or eight miles of the mine. But with the facilities for treating the ore on the ground that the mine has, it is independent of any railroad or smelter. The Keane Wonder was located about two years ago, and about $35,000 has been expended on it in development work. The ledges crop big and strong on the mountainside, on either side of a deep canyon which cuts the property. 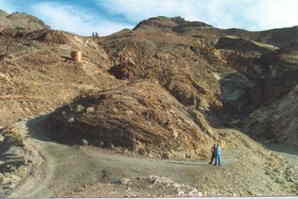 The ledges are a pinkish white quartz and dip into the sides of the mountain at nearly right angles to their slope, making flat ledges, and with the tunnels running in on the ledge, as the work has been done, not a pound of ore will be raised, but it will all be loaded into cars and run into the mill. The country formation is different kinds of schist, a garnetiferous schist predominating. Farther up the mountain lime prevails, while the eastern slope quartzite predominates. This is the property recently secured for the neat sum of a quarter of a million dollars by John F. Campbell of San Francisco, who has organized the Keane Wonder Mining Company. -- Tonopah Miner Inyo Independent, April 6, 1906 "KEANE WONDER" Many Engineers of world renown have visited the Keane Wonder and all pronounced it a great mine. Men like John Hays Hammond have visited the property and admitted the great showing. With all the chief topic of conversation was whether or not the ledge Keane�s Wonder claim was the same that cropped nearly a mile farther around the mountain. If it were, it would give a ledge which with those large values for over a mile would make the Keane Wonder the greatest gold mine in the world. The ledge is starting that way, and in the works so far done no sign of any break has shown, the ore holding out continuously, and undoubtedly more work will show the ledge to be the same continuous ore body. 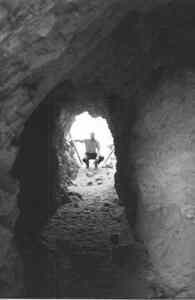 Last winter, upon his visit to Bullfrog, Curle, the great English engineer and author of the book entitled "The Gold Mines of the World," inspected the Keane Wonder, and to a party of Tonopah people he expressed himself of the opinion that this was one of the great gold mines of the world. 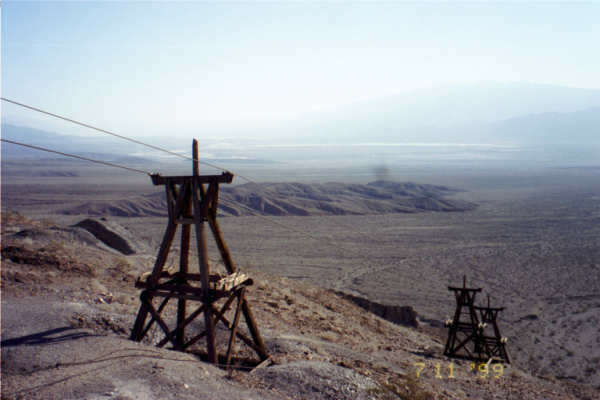 Towers of cable car system that carried ore from Keane Wonder Mine to the mill. Was operated by gravity and turned a generator which powered the mill. Photo shows Keane Wonder Mine Mill with cable car system towers in the background. 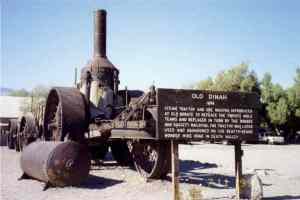 Old Dinah used to haul ore from Keane Wonder Mine.